Participatory budgeting (PB) has been developing fast across Scotland over the last few years, as made clear by the many varied examples and reports on this site. Aside from the odd exception, most PB initiatives in Scotland have seen communities vote on how to distribute funding to local voluntary and community organisations - often referred to as the 'small-grants model' of PB. However, there has been a growing interest in Scotland around how participatory budgeting (PB) can be used to enable local people to decide how core public budgets are spent on services in their area - this is what is often meant by the term 'mainstreaming'. This is a welcome development, particularly since the money appears to have been put forward by the council independent of the Scottish Government's Community Choices Fund, which has contributed funding towards a substantial amount of PB in Scotland over the last two years. It also comes at a time when the Scottish Government and COSLA have announced that at least 1% of local government budgets will be decided through PB by 2021 - which should mean PB is increasingly used to distribute core public sector budgets. There are many positives to the 'small grants model' of PB, such as increased participation, awareness raising of local activities and linking up between community organisations. But giving people more decision-making power over core local budgets (health, transport, housing, education etc. etc.) is also an important element of PB. It is likely that mainstream PB will be higher profile and attract more people into the process, resulting in a greater level of democratic participation. The mainstreaming of PB should not take away from the vibrancy and local-focus of small-grants PB initiatives. However, citizens having a direct say over core-public budgets is something we would like to see more of. 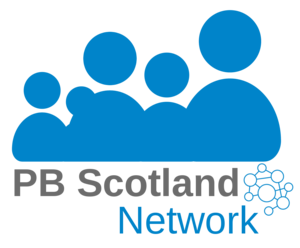 Keep an eye on the PB Scotland website to see how PB continues to develop around Scotland.